Boulder Philharmonic at Macky Auditorium. 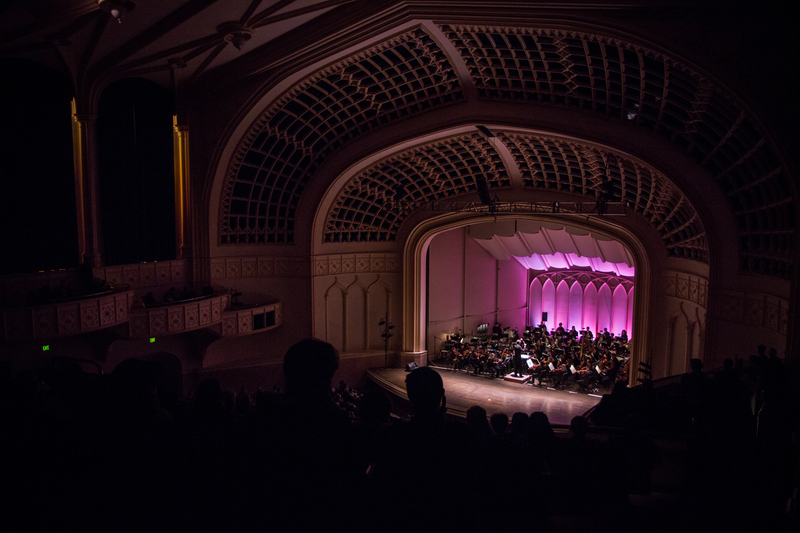 To facilitate and assist community cultural groups with access and affordability of performance venues, the Boulder Arts Commission and the University of Colorado offer up to sixteen days per calendar year of rent-free space at Macky Auditorium. DEADLINE TO SUBMIT APPLICATIONS: Applications are accepted by the first of each month, year round or until all rental dates are awarded. FUNDING DETAILS: The grant is for rent only; the applicant will be fully responsible for any and all additional fees required by the University, including but not limited to equipment rental, direct labor costs for technical staff, ushers, security personnel, etc. You may apply for a maximum of two days free rental annually. Supplementary Funds are available from the Rental Assistance Fund for applicants who may not be able to afford these additional costs. Please apply for the supplementary funds only if it is necessary to your use of the Macky Free Rental grant. These $1,000 supplementary grants are distributed on a first-come first-served basis until monies in the Rental Assistance Fund run out. ** Supplementary grants are no longer available in 2019. Funding for the grants has exhausted as of 2/1/2019. ** One grant per applicant per year is allowed. You may apply for a supplementary grant by checking the applicable box in this application. All applicants must have the requested dates confirmed with Macky Auditorium at the time of the application, and supply a letter of verification from the University with the pertinent date information included. Receiving a grant from the Boulder Arts Commission does not guarantee the award of a specific date or dates. The actual date(s) awarded will depend on availability of the space. It is the applicant’s responsibility to inquire about availability and pay for additional costs at Macky. The contact phone number for Macky is 303-492-8423 and website page is here. Timeframe. Macky auditorium rental event dates must take place after the grant funding decision and within the calendar year during which they are applied for. Venue confirmation. All applications must include a letter of commitment from the Macky auditorium management indicating the project date(s). Letters should follow the normal business standard, on letterhead when possible and signed by the author; email correspondence is not accepted. A contract with Macky auditorium including the project dates and rental fees is an acceptable alternative. Deliberation. Proposals for free rental of Macky Auditorium and supplementary funds are approved through administrative review by staff of the City of Boulder Office of Arts Culture and awards are announced at the next meeting of the Boulder Arts Commission following the deadline. Evaluation of applications. Proposals for free rental of Macky Auditorium and supplementary funds are awarded on a first-come, first-served basis to those who have met all the requirements of application, including the venue confirmation and budget summary. Award in previous years does not imply continued support. Each application is reviewed anew in the context of current policies and applications. Preview the full application here. Grant report forms are on the Boulder Arts Commission grants software. Log onto the same account used to apply for the grant, and look under ‘Follow Up Forms’ for the reporting form. After you you submit the report you’ll receive email confirmation and copy of the report via the email that you have included in the report. Contact Lauren Click at clickl@boulderlibrary.org or 720-564-2355 if you do not receive email confirmation.